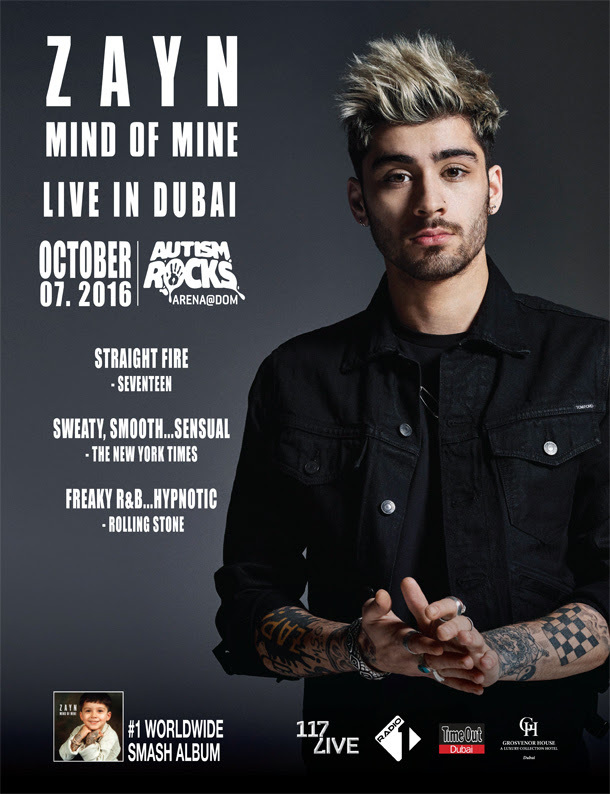 Watch Zayn Malik of One Direction Live in Dubai! It’s the moment every fan of Zayn’s in the region has been waiting for, and that moment has finally come. 117Live has officially announced that they will be bringing Zayn to perform live at the Autism Rocks Arena on October 7th, for one night only. This will be Zayn’s first stop in The Middle East. With the release of "Mind of Mine", Zayn made history as the first male U.K. solo artist to debut at #1 with their first album on both the U.S. Billboard Top 200 chart and the Official U.K. Albums chart, and he is the first U.K. act, solo or otherwise, to debut at #1 on both the U.S. and U.K. charts since 2009. The album debuted at #1 on the Billboard Top 200 chart with over 157K copies sold, distinguishing ZAYN as the first male U.K. solo artist to achieve a #1 with their first album on this chart.